If you’re not sure what skip counting is, think about counting by fives. Or twos or tens. Now think about counting by sevens or twelves. Now think about counting backwards from 120, by fours. That’s it. Skip counting is critical to having great number sense. It develops fluency in calculation, and it serves as the basis for multiplication and division. 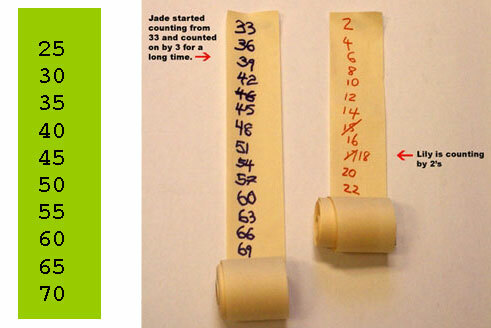 Here are a few games and teaching ideas to encourage skip counting. We played this all the time when I was growing up. The leader announces starting and finishing numbers and which numbers will be ‘buzz’. For example, we might start at 1, finish at 100, and say buzz on numbers that are multiples of 5. Students stand in a circle to count in turn by ones, but they say buzz instead of the specified numbers. If a student forgets to buzz, they are out of the game. Last one standing wins. This is a variation of Buzz. The rules are the same as for Buzz, but we buzz on some numbers, bizz on others and bizzbuzz when both are required. For example if we are buzzing on multiples of 3 and fizzing on multiples of 10 the correct sequence is “1, 2, buzz, 4, 5, buzz, 7, 8, buzz, bizz, 11, buzz, 13, 14, buzz, 16, 17, buzz … and bizzbuzz” is said instead of 30. This is an activity which assists children to move from orally counting by ones to skip counting. When counting from the starting number to the finishing number the children whisper the numbers that are not part of the count and say loudly the numbers that are part of the count. For example: If counting by twos the children would whisper the odd numbers and say loudly the even numbers (in bold): 1 2 3 45 67 8 9 10. In the following example the students are using Whisper Count to count by twos starting at 2 and stopping at 20. Initially, record all the numbers from 2 to 20. Have your child circle the numbers that are part of counting by twos, starting with two. Starting at one, you and your children whisper the odd numbers and say loudly the even numbers forwards from 2 to 20 and then count backwards from 20 to 2. Gradually increase the range. Starting, finishing and counting sequences can be changed according to the needs of your children. Give your children a strip of coloured paper or a roll of paper. They record a counting sequence as far as they can. You can assign the counting sequence and starting number or may allow them to choose their own. You can restrict the amount of time spent on this activity or allow children to explore the pattern as far as they are able. Writing the numbers vertically assists the students to focus on any patterns that are formed. What pattern did you notice when counting by fives? When counting by fives would the number 70 be part of your counting pattern? How do you know? What if you were counting by fives and started at 135 what would the next few numbers be? What if you were counting backwards by fives from 90 what would the next few numbers be? Initially children should place clear counters (you can buy them online) on a paper Hundreds Grid to mark the counting sequence. Clear counters are used so they can still see the numbers. Once the counters are in place they whisper the numbers that are not part of the counting sequence and touch the counters as they say loudly the numbers that are part of the counting sequence. Once children are confident with the counting sequences they will not need to use the Hundreds Grid. What number will come after 100 in your pattern? Can you continue counting by fives from 100? How would this help you count by tens?